For many, the tax owed is not the problem, but rather, it’s the penalties and interest that continue to accrue daily. IRS penalties and interest can cause a seemingly insignificant tax liability to soar out of control. Most people wait too long to address the issue and find themselves in a hole that is too big to dig themselves out of. When this happens, the best thing to do is to hire a tax attorney to assist with what’s called “an abatement of penalties.” An abatement of penalties, requests the IRS to eliminate certain penalties on a taxpayer’s account. Often times, an IRS employee improperly imposes penalties on the taxpayer because they do not understand the facts and law of the case. When this occurs, it is imperative to fight the IRS. Why is the IRS penalizing me? Failure to file a return: Filing your return late can trigger the failure to file penalty. The failure to file penalty runs at 5% per month, to a maximum of 25%, of the amount of tax owed. Interest on the failure to file penalty begins on the due date of the return plus extensions. Failure to pay taxes: Any late payment can result in the failure to pay penalty. The penalty is 0.5% per month, to a maximum of 25%, for late payment. Failure to properly report a tax liability: This penalty applies when a taxpayer fails to properly report their tax liability. This penalty is also known as the Accuracy-Related Penalty and can range from 20% to 40% of the tax due on the total amount of under-reported income. Fraud Any kind of purposeful tax deception can result in a penalty of up to 75%. Interest on the fraud penalty begins on the due date of the return, including any extensions and ends on the date the penalty is paid. How Do I Remove Tax Penalties? Because proving reasonable cause is fact intensive for IRS penalty relief, being current on case law and administrative guidance is essential. A tax lawyer can provide the resources and tools to be essential in helping you develop and execute a strategy forremoving penalties. 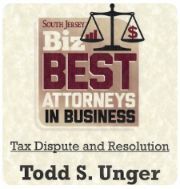 Todd S. Unger, Esq., LLC provides consultations to taxpayers facing tax penalties and interest and other federal tax controversy matters in both New Jersey and New York. To schedule your confidential consultation with a qualified New Jersey tax attorney, call us today at (877) 544-4743.